The Easter celebration only gets better when this gift box arrives. Filled to the brim with Lindor milk chocolate truffles by Lindt, delicious cookies, Lindt chocolate bunnies and more, this box is great for groups and is sure to be remembered. Lindt Mini Gold Chocolate Bunnies, Lindor Coconut Truffles. 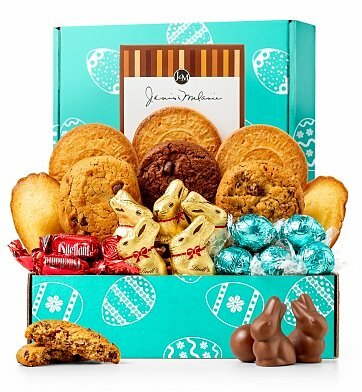 Easter Chocolate & Cookies Box is a hand delivered gift. These gifts are delivered by one of our local design centers located throughout the United States and Canada. Same day delivery is available for most gifts when ordered before the cutoff time. The cutoff time for Easter Chocolate & Cookies Box is in the recipient's time zone.